Think emojis are all just fun and games? Then you haven’t met one that manifests some of our deepest, darkest fears 😱. It wants to give you a balloon 🎈. It wants to charm you with juggling 🤹 at your birthday party 🎂. It wants to lure you under its big top 🎪. It’s 🤡, or the Clown Face emoji. The red, comically large smile of 🤡 Clown Face may not bring happiness to all screens, but one thing is for sure: We certainly find the 64-bit buffoon entertaining in one way or another. Let’s go behind the face-paint 💄 with some Emojiology of 🤡 Clown Face. Depicting a classic circus clown, 🤡 Clown Face marks content related to clowns, including performers, circuses, birthdays, and other venues and activities associated with them. Very often, the emoji stands in for a metaphorical clown, or fool. 🤡 Clown Face can also express a range of tones and feelings, including the silly, strange, scary, or sarcastic. 🤡 Clown Face entered the emoji ring as part of Unicode 9.0 in 2016 along with some other colorful faces, including 🤥 Lying Face, 🤢 Nauseated Face, 🤣 Rolling on the Floor Laughing, and, as we lassoed in our last Emojiology rodeo, 🤠 Cowboy Hat Face. Across platforms, 🤡 Clown Face resembles a circus or birthday clown, such as the iconic Bozo, Ronald McDonald, or, for many, Stephen King’s It. Above (left to right): Bozo the Clown, Ronald McDonald, and Pennywise from Stephen King's It from the 1990 miniseries. 🤡 Clown Face features white or whitish face makeup, a red nose, an exaggerated red smile, and two tufts of curly hair (red or blue) on an otherwise bald head. Most vendors depict blush on its cheeks. Several platforms, such as Apple and Samsung, illustrate outsized eyes lined with blue. Google and WhatsApp display more stylized eye makeup (stars or diamonds) while Facebook adds a miniature hat. 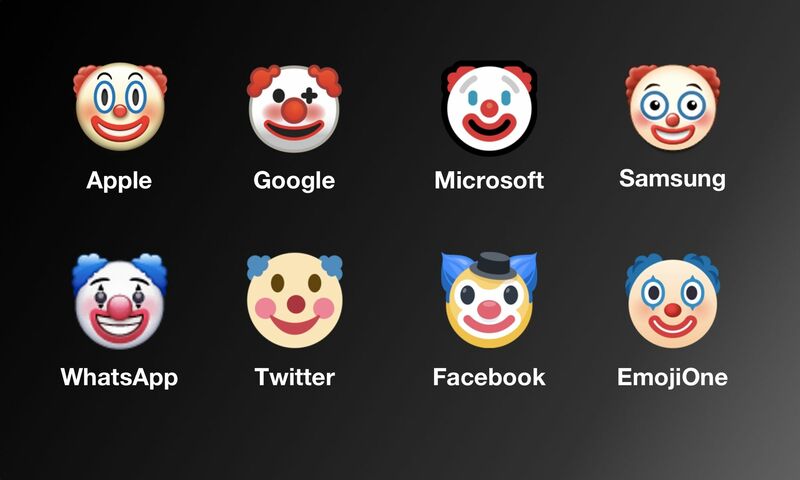 Above: How Clown Face displays across major platforms. Primary differences are hair color and eye design. 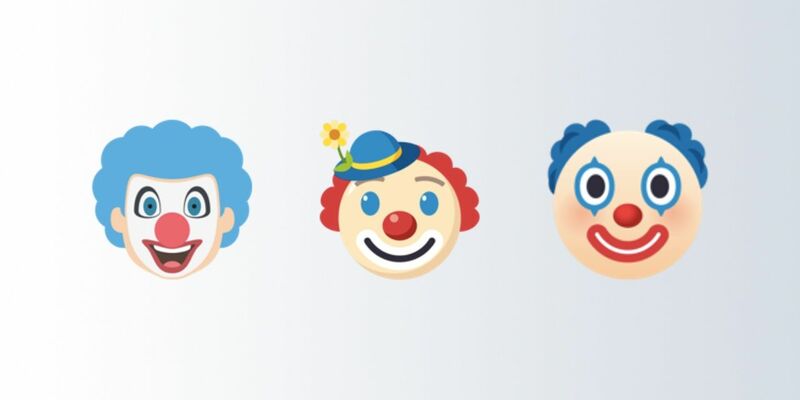 For its 2018 4.0 version, EmojiOne brought its 🤡 Clown Face design more in line with other major vendors. Under version 2.2.4, EmojiOne had given it a more realistic appearance with a full wig of blue hair, partial white makeup, and a proportional, open-mouth smile. Under 3.0–3.1, the emoji was more impressionistic, notable for its blue bowler hat capped with a yellow flower. Above (left to right): Clown Face on EmojiOne versions 2.2.4, 3.0–3.1, and 4.0. A cartoonish design didn’t make 🤡 Clown Face any less terrifying upon its release—or at least performatively so. News of its debut was met with ironic horror in the press, riffing on a popular fear of clowns, or coulrophobia, that spread starting in the 1970–80s. Other outlets almost universally described 🤡 Clown Face, it seemed, as a “creepy clown.” It didn’t help that Apple first supported 🤡 Clown Face under iOS 10.2 in December 2016, right on the heels of a so-called clown panic that fall, when there were menacing sightings of people dressed up as evil clowns all over the world. 🤡 Clown Face spiked on social media again in 2017 with the film It, the first big screen adaptation of Stephen King’s 1986 novel of the same name, whose bloodthirsty, blood-curling clown Pennywise caused many a nightmare. Trailers and theatrical posters for the film also featured an ominous red balloon, making Balloon 🎈 a natural pairing with 🤡 Clown Face online for all things It. Elsewhere in scares, the 2018 comedy film Blockers mocked moral panics over sexting—and the secret language teens are always feared to be using—in a scene when parents decipher a group text revealing their daughters’ pact to lose their virginity on prom night. The conversation is encoded entirely in emoji, and the 🤡 Clown Face makes an incongruous appearance. As one father explains it to a bewildered mother: “That means she’s down to clown,” a slang expression implying the daughter is willing to engage in some sexual tomfoolery. So, how are young people actually using 🤡 Clown Face? Many superimpose it on the faces of their exes or former friends when sharing old pictures on apps like Snapchat. This not only blots out a past partner or pal but also presents the person as a metaphorical clown, or fool—a move as unsubtle as the bright makeup and bold features of clowns themselves. What’s more, a quick look around social media will show that this use of 🤡 Clown Face isn’t just a dose of adolescent attitude. Adults extensively use 🤡 Clown Face to insult someone or something as clownish, i.e., idiotic or contemptible in some way. Clowns aren’t entirely unlovable, for all the pies 🥧 we throw in their faces. They still hold a reputation for general zaniness, and so we see texters and tweeters occasionally using 🤡 Clown Face to mark the tone of a message as goofy or quirky, sarcastic or ironic, or just downright weird, as we’ll see in the following section. 🤡 Clown Face is a two-act emoji. The first act is literal, with the emoji used for real clowns or similar performers as well as associated venues (e.g., circuses, birthdays, hospitals, rodeos) and activities (e.g., juggling). Here, 🤡 Clown Face may be paired with other circus- or entertainment-related emoji, such as Peanuts 🥜, Elephant 🐘, or Performing Arts 🎭. When its comes to actual clowns, however, you’ll likely see 🤡 Clown Face representing an evil clown, whether as a costume or fictional character. This is especially common around Halloween. Evil clowns lead us to the second act of 🤡 Clown Face: its figurative applications, thanks to the various associations clowns have in the popular imagination. 🤡 Clown Face often conveys creepy behavior or scary feelings. On a lighter side, 🤡 Clown Face can indicate someone or something is goofy or dopey, full of the playful antics of clown. Silliness and foolishness, though, are often the target of judgment, and so 🤡 Clown Face very frequently dismisses something or someone as a clown, as in a moron, dolt, or other such disliked figure. On social media, strong critics of US President Donald Trump regularly refer to him as 🍊 🤡, or the Orange Clown. What a lying hypocrite 🍊🤡 is! We are 40-some days into Kavanaugh’s confirmation process. The GOP refused to consider Garland for well OVER A YEAR. But this, THIS, the Liar-In-Chief points to as unprecedented obstruction by Democrats. We don’t have amnesia you fool. Finally, perhaps due to the forced-seeming, off-putting cheerfulness of clowns—look no further than Samsung’s 🤡 Clown Face design—people occasionally use 🤡 Clown Face to communicate a kind of ironic detachment, with a sense of the strange or bizarre in some situation or behavior. Our relationship to clowns in emoji form seems as complex as our relationship to them in real life. Clowns at once unsettle and amuse us, and perhaps it’s this tension that gets expressed in the varied and idiosyncratic ways we use 🤡 Clown Face.